After spending several months in a relatively narrow trading range, the S&P 500 Index (SPX) finally broke below key trend line support at the 1,319 level with all major technical oscillators positioned bearishly. The current set-up suggests that a possible move down toward key trend line support at the 1,174 level will likely occur over the coming weeks or months. Worries that a “run on the banks” of Greece, Spain and possibly Italy clearly has investors fearful about default contagion, or the nationalization of a number key institutions. That said, a bold move by the ECB could stem some of these concerns if it acts quickly. Even if a Eurozone backstop were to be implemented, the underlying problems causing current fears may only diminish marginally, however. Nevertheless, European bank woes appear to be playing a big role in the decline in the Eurodollar and a concurrent rise in the U.S greenback. In turn, this currency shift has put downward pressure on both commodity prices as well as U.S equities in recent weeks. Unless clearer political and banking footholds get established in Europe soon, continued downward pressure on the Eurodollar, commodity prices and equity prices will likely be realized. Further, 10-year U.S. Treasury and German Bund yields will presumably extend their respective declines to new all-time lows. If this occurs, a number of sovereign debt spreads should continue to widen to distressing levels. Adding to investor nervousness was last week’s revelation of an unexpected $2B-to-$5B loss at J.P. Morgan. At the very least, this news along with a dramatically flatter yield curve has caused a sense of unease over the profitability of large U.S. banks in general, sending the financial sector sharply lower. Since a bullish move in the equity markets is usually accompanied or led by a rise in the financial sector, a renewed move lower in bank stocks is a big negative. 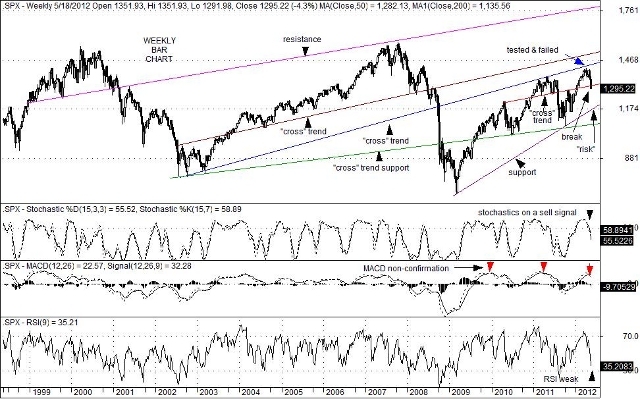 This entry was posted on Thursday, May 24th, 2012 at 12:08 pm	and is filed under The S&P 500 Index (SPX). You can follow any responses to this entry through the RSS 2.0 feed. You can leave a response, or trackback from your own site.